I first considered becoming a sports writer my sophomore year of high school, the 2010-2011 school year. That was the year I really started to implement sports (mostly basketball really) into whatever writing I did, even my academic writing. It started with a vocabulary quiz I had in my English Ten Honors class. We had to write a story using that week’s vocabulary words, but it didn’t have to be a story in the sense that there are characters with conflicts who solve their problems. Basically, we just had to write a passage that proved we knew the meanings of these words and could apply them into our own writing. Looking back, I guess I figured it would be a good opportunity to write about basketball for a couple of reasons. Other than school, I didn’t do much anything, nor was I interested in much anything else besides basketball. I didn’t have much anything else to write about. I also knew my English Ten Honors teacher, Mr. Clark, was the one teacher who would actually understand and possibly enjoy what I had to say about basketball, so I went for it. I ended up writing about Kirk Hinrich (what a surprise) and how upset I was about him being traded to the Washington Wizards. But I didn’t just say I was upset because Kirk’s my favorite and I didn’t want him to leave my favorite team. I had a legitimate reason: Kirk was traded to make more cap space for a potential LeBron James signing, so I felt it would have made more sense to trade Luol Deng. Regardless of that, though, I rambled on about Kirk, because that’s what I do, and Mr. Clark seemed to enjoy it. I continued to write about basketball for all of those quizzes, and I even found ways to make basketball references in my papers—throughout the rest of high school. Implementing basketball into whatever writing I could make me realize being a sports writer is something I’d really enjoy doing for the rest of my life. But it wasn’t until 2012 that I became set on pursuing a career as a sports writer. In April 2012, I started my first gig as a sports writer when I joined Pippen Ain’t Easy as a staff writer and social media reporter, Mr. Clark was one of the first people I informed about the job (I think he was the second person after my twin sister Amanda, but I’m not positive), and he has been reading my work ever since. A little after I started writing for PAE, Mr. Clark told me about Grantland. He wrote the site’s URL and the name “Bill Simmons” on a cut up index card, gave it to me, and recommended I check out the site—specifically Simmons’s work. I had heard of both Grantland and Bill Simmons before, but that was the extent of it. I’m glad he told me about it, though, because then it would’ve taken me longer to discover Grantland and the exceptional work it presented to the world. Because of it, I learned about Zach Lowe, Kirk Goldsberry and his awesome graphics, netw3rk (AKA Jason Concepcion, a fellow Filipino basketball writer! ), and countless others. If it weren’t for Grantland, I would have heard of Rafe Bartholomew or read his work and, more importantly, learned more about my favorite sport and its relationship with the Philippines. Discovering Rafe Bartholomew’s work on Grantland also led me to his book, Pacific Rims: Beermen Ballin’ in Flip-Flops and the Philippines’ Unlikely Love Affair with Basketball. I’ve wanted to read the book for a long while now, but I just recently decided to buy it because it would help me with my sports sociology project—I’ve been writing a bunch of short papers about basketball in the Philippines. I haven’t been able to actually read too much of it yet, but I’ve enjoyed what I’ve read so far and have no regrets about getting the book. I even got a reply from him on Twitter, so I’m not complaining. 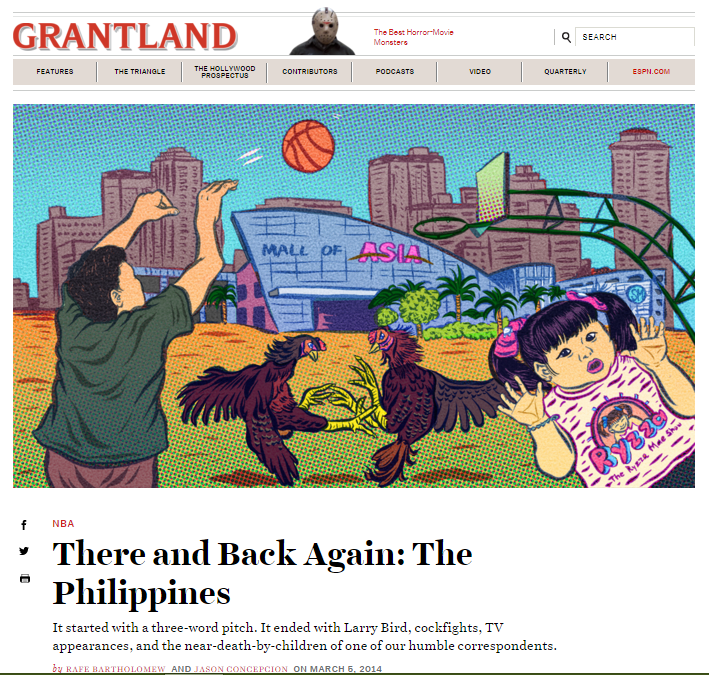 I wouldn’t say I have a favorite Grantland piece, but the one that sticks out to me is “There and Back Again: The Philippines” simply because it involved basketball and the Philippines. Despite being Filipino and growing up in a Filipino household, I never learned too much about the Philippines. I can speak bits and pieces of Tagalog, and I can understand it more than I can speak it, but I don’t know too much about the history and other things like that. I’ve also never been there, so it was great just reading more about the country and basketball at the same time. It was also very interesting to read because I could somewhat relate to netw3rk since I, as aforementioned, can’t really speak Tagalog either. I’ll be honest, though. I don’t remember too much else about what exactly is in the piece, just a handful of bits and pieces, but now I have an excuse to reread it. It’s a shame that it’s the end of Grantland that’s making me reread it, though. 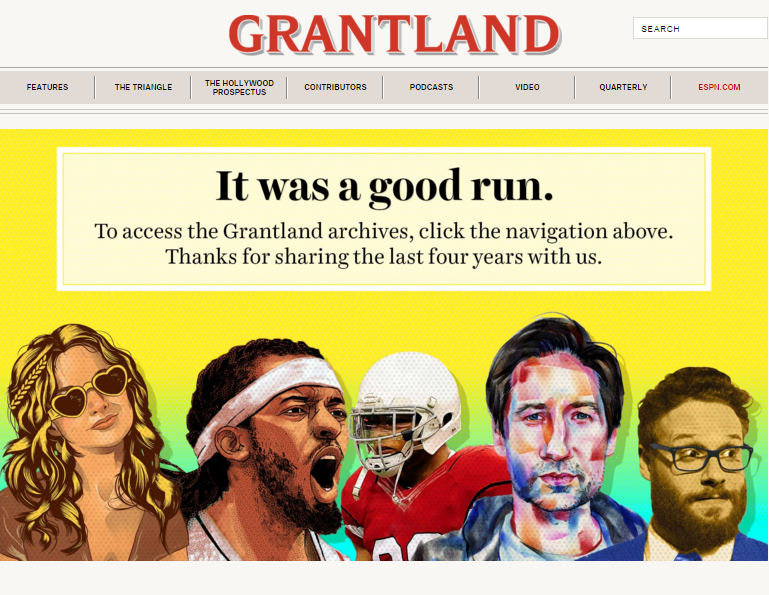 But my habit of visiting Grantland ceased to exist when the semester ended. After that, I would read Grantland whenever I came across it on my Twitter timeline. That’s not going to be the case anymore with its demise, and it doesn’t surprise me that it came to this—I’m not sure any Grantland fans were truly surprised by the news. But I’m still thankful that it ever existed. Like countless others, I enjoyed having Grantland as a site to find a plethora of quality sports writing, something to look at as an aspiring sports writer. Grantland helped me realize I do want to spend the rest of my life writing about sports. And while there won’t be any new content posted, I know there is a seemingly endless amount of basketball writing there that my eyes have yet to see.